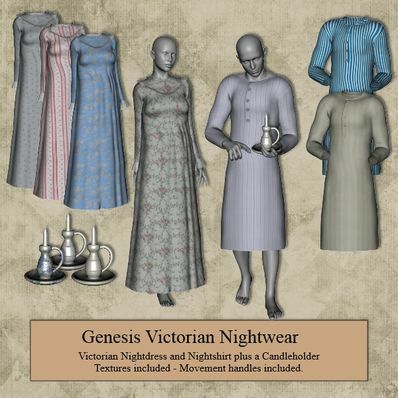 A Victorian Nightdress and Nightshirt for Genesis for use in Daz Studio 4.6. Several textures for both. Movement Handles included. A set of pajamas is very beautiful, thank you. What fun! Love the Victorian Nightwear!! Love the textures as well, thank you! The era clothes are really great - thanks! Thank you for the the PJ's and the candle holder. Great work.